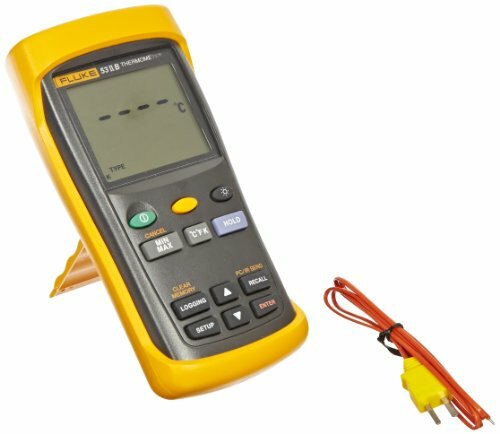 The Fluke 50 Series II digital thermocouple thermometer is used for applications requiring a broad range of temperatures, including furnaces, kilns, freezers, and other industrial applications. This thermometer measures temperatures in Celsius, Fahrenheit, or Kelvin via a Type K, Type J, Type T, Type E, Type N, Type R, or Type S thermocouple probe. It comes with one or two Type K bead thermocouple probes with 40" cables that measure from -40 to +260 degrees C (-40 to +500 degrees F). It can store up to 500 points of data for analysis and monitoring, and it has an infrared communication port for exporting data to a computer for analysis. This thermometer provides the relative time of minimum, maximum, and average temperature measurements for monitoring. It has an offset function that allows the operator to compensate for thermocouple errors and increase accuracy. The thermometer body protects against splashing water and dust, and it comes in a holster that absorbs impact to help protect against damage if dropped. The thermometer enters sleep mode after 20 minutes of inactivity to help preserve battery life. It conforms to National Institute of Standards and Technology (NIST) standards for compliance with regulations. The European Conformity (CE) marking indicates compliance with applicable European Union (EU) directives, and CSA mark indicates compliance with applicable Canadian Standards Association directives. This thermometer is suitable for measuring the temperature of equipment, systems, and processes in industrial and manufacturing environments.